Haise was born in Biloxi, Mississippi on November 14, 1933. He graduated with honors in Aeronautical Engineering from the University of Oklahoma in 1959. He completed postgraduate courses in the USAF Aerospace Test Pilot School at Edwards Air Force Base in 1964 and the Harvard Business School PMD Program in 1972. Haise completed US Navy flight training in 1954 and served as a US Marine Corps Fighter Pilot in VMF-533 and VMF-114. He had further assignments as a Tactics and All-Weather Flight Instructor at NAS Kingsville, Texas. While flying with the Ohio Air National Guard, Haise was recalled into the USAF in 1961 with the 164th TAC Fighter Squadron. He has logged 9100 hours of flying time in over 80 types. A 20-year NASA career was begun as an Aeronautical Research Pilot at Lewis Research Center in 1959. Further assignments were held as a Research Pilot at the NASA Flight Research Center in 1963 and as an Astronaut at Johnson Space Center in 1966. 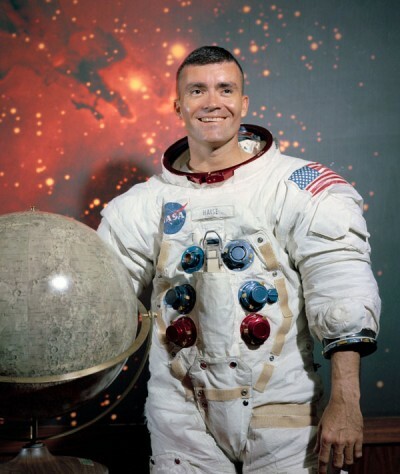 Haise served as backup crew for the Apollo 8, 11, and 16 Missions. He flew as the Lunar Module Pilot on the aborted Apollo 13 Mission in 1970 that was dramatized in the Hollywood movie titled “Apollo 13”. He also flew five flights as the Commander of the Space Shuttle Enterprise in 1977 for the Approach and Landing Test Program at Edwards Air Force Base. He is an Associate Fellow of the AIAA and Fellow of the Society of Experimental Test Pilots and the American Astronautical Society. Haise is a member of Tau Beta Pi, Sigma Gamma Tau, and Phi Theta Kappa honor societies. Haise resides in Pasadena, Texas with his wife, the former Patt Price of Rogers, Texas. He was inducted into the U.S. Astronaut Hall of Fame on October 4, 1997.